A firefighting vessel entered service in Jinshan District's Fenjing water town this month. The hydraulic canon on the boat ejects water up to 30 meters. 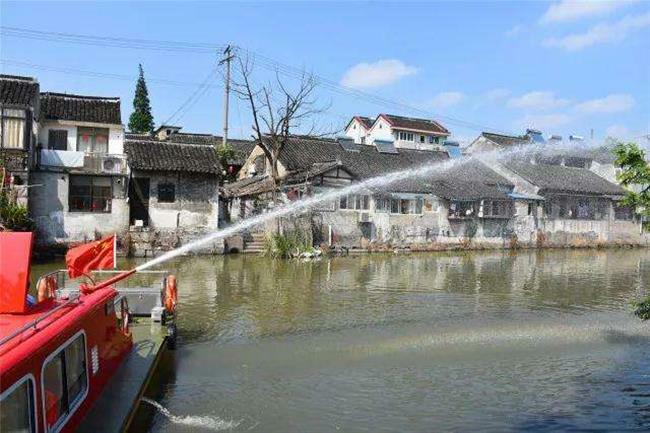 The 10-meter-long boat was customized to fit the size of the canals in Fengjing and is the first firefighting vessel used in the city's watercourse. The boat is equipped with all the standard tools one can find on a normal firefighting truck. Apart from fire extinguishers and water guns, the boat also has a hydraulic canon which ejects water as far as 30 meters. The canon covers areas fire trucks cannot reach due to the cobblestone lanes in the water town being too narrow. All historical buildings in the town are within range of the canon. The firefighting department of Jinshan has sent firefighters to learn how to steer the boat.